Like so many other cultures, the Mayan religious centres were designed along the principles of sacred architecture, which retold the story of creation. The Papantla Flyers, descending from the World Tree/Polar axis, which links the Earth with the heavens Sacred space. All ancient civilisations prided themselves that they lived in the “centre of the world”, in an environment that was either made by or modelled upon the gods. The Maya civilisation of Latin America was not different. Their monuments, from Chichen Itza to Palenque, were modelled upon a divine plan; they were literally rebuilding creation, whereby their mythology was expressed within the landscape. The Mayan story of creation has survived the destruction of the Spanish invasion. It is contained within the Popol Vuh, a 17th century book of the history of the Quiche Maya. The story of creation details the activities of the Twin Maize Gods and their family in the Third Creation, which the Maya date to 3114 BC. This date should not be taken literally – like the 4004 BC that people calculated as the date for Creation based on the Bible. Many scholars now believe that August 12, 3114 BC marked a significant celestial event, with one author, John Major Jenkins, arguing that the Mayan careful stellar observations resulted in their knowledge of what is known as the “galactic centre”. It is this stellar phenomenon that is also linked with the Mayan calendar’s end date of December 21, 2012 AD, which experts like Linda Schele remarks is nowhere mentioned as a physical end for the world within the Mayan literature. But back to the creation myth. When playing ball, the Twin Maize Gods disturbed the lords of Xibalba, the Maya underworld. The Xibalbans summoned the Maize Gods to the underworld to answer for their disrespectful behaviour. They subjected them to a series of trials. When they failed these tests, they were killed and buried in the Ball court of Xibalba. The eldest twin was decapitated; his head hung in the groud tree next to the ball court, as a warning to anyone who might repeat their offence. Despite this warning, the daughter of a Xibalban lord went to visit the skull, which spoke to her, spitting in her hand and thus making her pregnant. Escaping from the underworld, she gave birth to twin boys, the Hero Twins, Hun-Ahaw and Yax-Balam, who themselves were summoned to the Underworld, after they had found their dead father’s ball playing equipment. Like their father, they too made too much noise, but they were not fooled by the trials of the lords. After a long series of ballgames, the Hero Twins defeated the Lords of Death and resurrected their fathers, which were reborn as infants. They quickly grew to adulthood, and with dwarf helpers, woke up three old gods. Two of them became known as the Paddler Gods, because they paddled the Maize Gods to the Place of Creation. The third oldster, God L, was the patron of the merchants and warriors, and destroyed the Third Creation by a great flood. When the Gods arrived at the place of the New Creation, they sprang up from a crack in the back of a Cosmic Turtle. The Maya identified this turtle with the three stars of Orion’s Belt. The crack is identified with the Ball court. Once reborn, the Maize Gods directed four old gods to set up the first Hearth of Creation to centre the new order. This was a hearth made up from three stones. 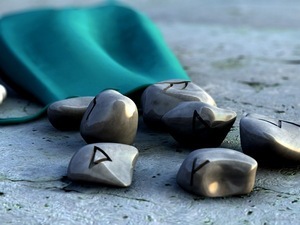 The first stone was in the shape of a jaguar, the second in the form of a snake and the third was a crocodile or shark. The first was set in a place called Na-Ho-Kan, by the Paddler Gods. The second stone was set on the Earth, but by whom is not known. The third was set in the sea by Itzamna, the First Sorcerer. 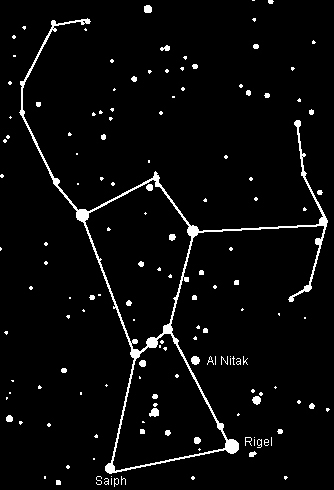 The Maya saw this hearth in the sky, as the triangle of stars below Orion’s Belt (Al Nitak, Saiph and Rigel), with the Orion Nebula as the fire. This hearth was set up on August 12, 3114 BC – the day of creation. 542 days later, on February 5, 3112 BC, the Maize Gods completed the Fourth Creation, by setting up the four sides and corners of creation and erecting the centre tree – the world tree. This tree was the Wakah-Kan, or “Raise up Sky”. It was a great ceiba tree in flower, because February 5, the day of its erection, was also the flowering season for this popular Latin American tree. The tree’s stellar equivalent is the Milky Way. On the same day, the Maize Gods spun the heart of the sky in the motion used by weavers’ spinning thread. This spinning corresponds to the motion of the constellations around the North Pole. The Mayan story of creation also incorporates a number sequence, from three to four, to five. Three is represented as the cosmic hearth, and the triangle; it is linked with August 12, 3114 BC. From there, the four sides and corners are created; a square. Finally, five is the square with a centre: the World Tree, identified with February 5, 3112 BC and the ceiba. 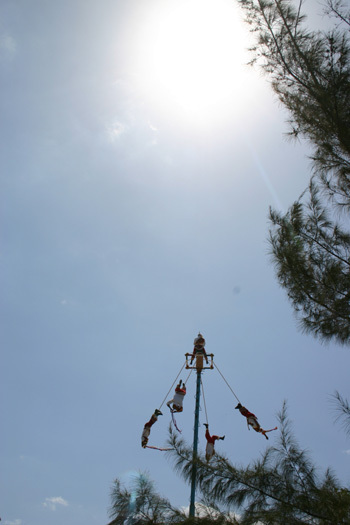 Like the Celtic tradition has the May Pole as an expression, the Maya have a similar “pole”, from which the Papantla Flyers descend. Also known as “bird men”, they dance in order to please the gods. A group of men are attached to a rope hanging from the top of a 50 feet pole. While they descend, the flute represents the voice of birds. The descent mimics the World Tree, whereby the dancers are like the motions of the stars, spinning around the pole. The main dancer, the musician, dances on top of the pole and turns first to the East, the origin of the world. Each “volador” turns 13 times around the pole. 13 circles multiplied by 4, for a total of 52 circles. In the Mayan calendar, every 52 years make a solar cycle. And every 52 weeks make a year, which gives birth to a new sun so that life may go on. The “birdmen” thus also represent the god Itzamna, the bird who sat on the world tree. Like the ancient Egyptians, the Mayans had their “phoenix”, whereby the mythical bird not only resided in the “centre of the world” – the World Tree – but also was the symbol of regeneration, recreation of the world and the start of a new era. Itzamna was the chief deity of the Mayan pantheon and represented the sun. The sacred cenote of Chichen Itza Several murals at Palenque feature the World Tree. In one depiction, two rulers face the tree. The roots of the tree present the face of an underworld monster, whose body reaches upward. A highly stylised World Tree is seen on the tomb of the ruler Pacal, who was interred in Palenque in 683. His stone coffin was covered with a five-ton lid, depicting the ruler falling into the abyss, with the World Tree present. A similar sacred geography is suspected at Dos Pilas, where the focus is on the royal shrine, identified as a sacred “Witz” mountain, linking the sacred and profane Maya worlds through the sacred tree of life, to an underground cave system of Xibalba that follows the east-west layout of the city connecting the Western Plaza and Duende groups. These elements were used in the design of their complexes, but this myth was not the only “leitmotiv”. The myth of the beginning of civilisation speaks of a “lost homeland”, which many popular authors in the 1960s and 1970s quickly identified with Plato’s legendary Atlantis. The Mayan myths speak of their “place of origin” as having a Snake Mountain and a Place of Reeds, or Coatepec and Tollan. In one version of the myth, the Aztec built a temple on top of Snake Mountain for their patron god Huitzilopochtli, who then built a ball court at the base of the mountain, and in the centre he placed a hole, called an Itzompan, or Skull Place. It is clear that this myth shares many aspects with the creation myth. Under Huitzilopochtli’s direction, the Aztec partially damned up the hole to create the “Well of Water”. The well was then filled with freshwater creatures. The best place to see this myth being expressed in the landscape is in Chichen Itza. Chichen Itza is one of the most popular and spectacular Mayan sites. 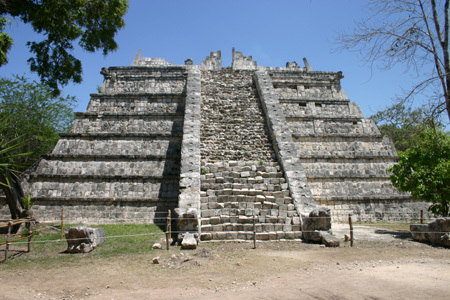 The name Itza itself is derived from Itzamna, the chief Mayan deity. It functioned as a regional capital of the Maya from 750 to 1200 AD. Chichen Itza’s Mayan name means “city on the edge of the water sorcerer’s well”. 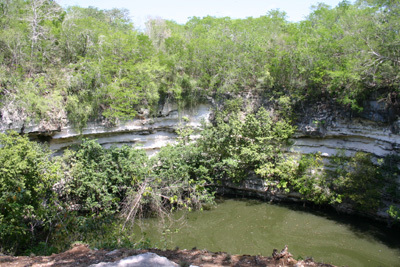 The well is the Sacred Cenote and its presence may have been the main reason why the town was built where it is. The town itself is divided in two sections. Some believe that one section was built by the Maya, the other by the Toltec, but this version is now being disputed by archaeologists, who have shown that both parts are largely contemporaneous. It is equally clear that each is largely a mirror of the other; each had its own cenote. Could we thus have an expression of the “twin” aspect? El Castillo, the famous pyramid of Chichen Itza, symbolised the Snake Mountain – the place of origin. Each religious site had a representation of the “Snake Mountain”; in Teotihuacan, this role was performed by the Quetzalcoatl pyramid. Quetzalcoatl was the “flying serpent”. The serpentine connotation of El Castillo is visible through the serpent carved on its side. On the equinoxes, the sun plays a light and shadow game, bringing the snake alive. The effect is actually viewable for a week before and after each equinox. As the equinox sun sets, a play of light and shadow creates the appearance of a snake that gradually undulates down the stairway of the pyramid. This diamond-backed snake is composed of seven or so triangular shadows, cast by the stepped terraces of the pyramid. Even further calendrical aspects have been incorporated into the pyramid’s design. Each of four stairways has 91 steps, with a final step at the top making a total of 365 days, the number days in the solar year. This “quartering” of the year further conforms to the 91 days that separate the solstices from the equinoxes. Such engineering is a clear example of the advanced building skills and calendrical planning of the ancient Maya. 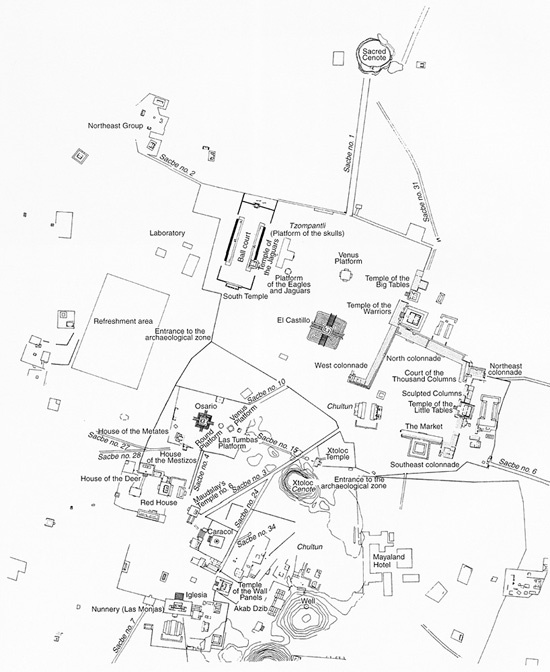 But the Maya were not just engineers; Chichen Itza was, after all, a religious complex. Many scholars now believe that the “Flying Serpent” is the “Vision Beast”. Like many religions, the Mayan priests tried to induce visions. One methodology used was bloodletting, whereby the resulting trance was visualised as the “victim” being eaten by the Vision Beast: he entered the Otherworld. Quite often, this “shamanic voyage” occurred on top of the pyramid, where the god himself voyaged from this to other realities – and back. Nearby is the Ball Court, whereby the Ball court of Chichen Itza is both one of the most impressive and one of the best preserved. The Ballgame had a sacred function, visualising with the myth of Creation and Origin. Many believe that the Ballgame was a sport, played to life and death. Whereas this may be one aspect of it, it really was the visualisation of the story of the creation of the fourth world – theatre, more than sport. The Maize God died and was reborn in the ball court. The Maya defined the space as a crack in the top of a mountain or the back of the Cosmic Turtle. It was much more than a stadium. People went into this site – down this crack – to contact their ancestors and consult oracular deities. The rulers negotiated and sealed alliances in the ball court and captured kings died by sacrifice inside them. Nearby is the “Skull place”. Tour guides will tell stories that the captain of the winning team was decapitated, whereby his decapitated head was brought to the T-form shaped platform. It is, of course, the location where the skull of the decapitated ball player, sacrificed at the time of the Third Creation, was located. The subject of crystal skulls is a hotly debated topic, but even though some may be modern fabrications, a certain number – normally the less impressive ones – are clearly ancient and original – original to what seems to be the Mayan domains. As such, we can only wonder whether these crystal skulls were specifically designed to function as the religious artefacts placed in the “skull places”. The Pyramid of the High Priest, mirroring El Castillo in the other section of Chichen Itza The heroes of the creation story entered the underworld. Though the Ball court sat on top of this crack, it was not the only “underworldly aspect” that existed. Inside El Castillo is a man-made cave, which was equally believed to be a passage to the Otherworld. The chamber contains a statue of a red jaguar, decorated with flint teeth and jade eyes. Built into one of the exterior walls of the ball court is the Temple of the Jaguar, which features another jaguar throne. Since this one was not buried for a thousand years, its red paint and jade spots are long gone.